In the months leading up to our baby’s birth, we searched for a mobile for her room. We wanted something that wasn’t too babyish; something that would be interesting for her to look at (considering how much time that little one was going to spend on her back looking up! ); that meshed with the overall mood & colors of the room; and finally, something natural-ish that could gently twist and sway with the air. Alas, we never found anything that fit the bill. After seeing something interesting made on a design show, while around the same time coming across some Martha Stewart Crafts Pom Poms at Walmart, we figured we could make a mobile ourselves… and we did. We went with two tiers, wider at the top and narrower at the bottom, like a chandelier. We got a simple wooden dowel at the hardware store and cut it to size. To attach the pieces, we cut out notches so they fit snugly together in an X, then secured them with wood glue and a nail. 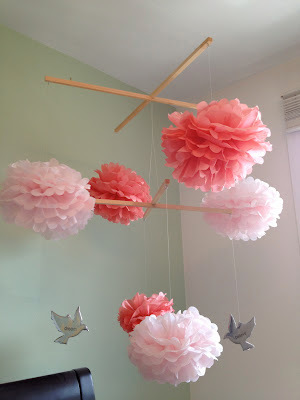 We attached little eyelet screws at each corner and hung the tissue-paper pom poms from each, with translucent fishing wire. 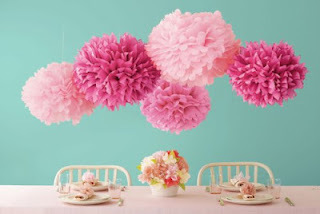 The pom poms came in different colors, so we alternated them and varied the heights to add interest. Note: This seemed like a good idea at the time but it became a real challenge to balance the different weights. It was always coming out lopsided. We just kept retying the wire until it was balanced… but it took a while and of course one of us had to hold it up…. We repeated the same method of hooks and wire for hanging the 2nd level from the top level. 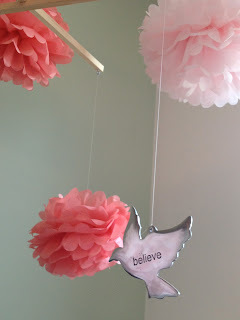 To personalize it, we used two adorable silver birds stamped with the words dream and believe, which are so fitting for a new little life. To hang it, we joined 4 wires from each corner, and attached them onto a regular key ring we had. We screwed in a plant-holder hook into the ceiling, and hung it.